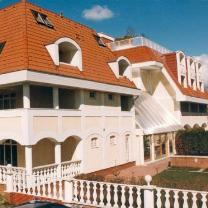 This family-run hotel is located in Keszthely, 350 meters from the shore of Lake Balaton. We are waiting for our guests and groups with extended services to meet the needs of the guests who choose wellness relaxation, providing them with the opportunity to preserve health and physical and mental relaxation. The Kakadu Guesthouse-Hotel is a three-star hotel, but is succeeding all the needs against a luxury hotel. We offer hotel-service on guesthouse-prices 500 m far from Lake Balaton. On the groundfloor there is a restaurant with terrace for the groups and a halfboard to give them. Between the two buildings, under a bridge there is a charmy, heatable, modern inside swimming-pool with a floor-heated sun-bathe terrace, and where from a panorama-elevator takes up to the floors and the giant roof-terrace, which gives a beautiful sight onto the capital of Lake Balaton, Keszthely, and the Balaton-highlands. The most of the rooms have roofed balcony, cable TV, telephone, refrigerator, shower-WC block, and some of them have also a mini-kitchen. For the groups there is a conference hall which can seat 50 guests. In the basement there is dental and rheumatic medical service, sauna, solarium and sparkling bath waiting our guests. The hotel has its own parking place, and for the guests there is also a secured parking place. The hotel has central-heated rooms, and is open in the whole year. There is also a playground, bike-parking and 400 m2 parzed sun-bathe garden around the hotel. In the Kakadu Hotel you can join in several programs, which make the holiday more pleasant and unforgettable. The one-week "Winter Balaton" program is particularly important because it shows the life and the winter fun around Lake Balaton. We provide a bus service to the world-famous thermal spa, Hévíz, which is 6 km away from the campsite and which offers medicinal cures to our guests.